Your kitchen serves as the hub of your home and therefore it is necessary to purchase the best kitchen gadgets and appliances that perfectly stand up for regular usage. There are different varieties to consider in this category starting from mini refrigerators and dishwashers to blenders, coffee machines, toasters and kettles. You can go for the powerful and compact Morphy Richard Hand Blender for whipping tasty bakes or the stunning French-style Hisense Refrigerator hat will be easy on your pocket and the eye of the onlookers. For multi-tasking chefs, the Mastrad Thermometer Spoon will be an affordable and fun device for cooking with great precision. Do you like waking up to freshly squeezed orange juice? Go for the Smeg Citrus Juicer that will grace your kitchen countertop. There are very few small and best kitchen appliances that are a combination of healthy eating and convenience. 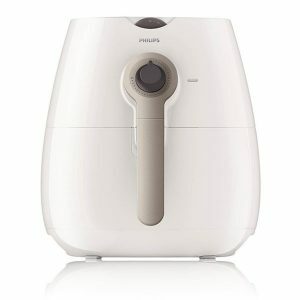 In this category, the Philips Viva Airfryer Health Fryer comes as an exception. It not only possesses the ability of making fresh fries with around 80% less fat but it is also a whizz at baking, grilling and roasting vegetables. It offers perfectly crispy and delicious food within seconds. Also, it has the ability of baking fruit crumble; roasting whole chicken and cooking a rack of lamb. One thing that is noteworthy about this Airfryer is that it comes with a recipe application that can help the users in exploring the machine’s potential. The speedy cooking of this products is all because of improved technology and instant heating for even and golden brown results. The only thing that the users need to do is set the temperature and the timer. When they are finished, simply detach the handle and have it cleaned in the dishwasher in less than 90 seconds. Try making room for this small kitchen gadget in your home and you will surely be rewarded. The range of small and best kitchen appliances available from Smeg is mind-blowing and it continues to expand at a very fast pace. The range now includes the gorgeous retro and the super powerful and compact CJF01 Citrus Juicer. This is a classily constructed product that is available in different colorful finishes. The item is incredibly silent with a 70 watt motor that starts working from the moment the users press their half-sliced citrus fruits onto the reaming cone. The entire body of this gadget is made of solid stainless steel and it is also dishwasher safe. This product is aesthetically consistent with shiny chrome and 1950s curves. The amazingly rounded base of the item is made of aluminum and it comes powder coated in different hues. The lower part of the product features chromed-metal and it manages the cables. There is a clear Tritan plastic covering sitting atop for keeping off dust while the machine is being used. There is a non-drip spout that can easily be pushed up for operating a valve that stops all kinds of unrequired juices from coming out of the collector. This is simply a good touch, isn’t it? There are more affordable motorized juicers available in the market, but none of them look and feel as luxurious as the one from Smeg. The juicing performance of this product is simply beyond the reach of other models. This is a small and beautifully formed appliance. It can extract the sweet liquid goodness of fruits like lemons, limes, oranges and grapefruits. It can handle almost anything that you might generally slice and squeeze. There are three removable parts in this item. First, there is the reaming cone made of stainless steel. Second, there is the hole-peppered steel strainer tray for collecting pips and pulps and finally there is the Tritan juice collector featuring an in-built spout. Part multi-tasking kitchen gadget and part stand-mixer, the Bosch Kitchen Machine Stand Mixer includes seven blending speeds and three-zone movable arm. Some of the most important features of this product include seven blending speeds and three-zone movable arm. It has got all the functions and attachments that you would expect from a top quality and affordably-priced mixer. The stand mixer version of this product mixes, beats, kneads and whisks while the constant feed shredder offers five different types of shredding, chopping and slicing-both coarsely and finely along with grating. More compact in comparison to the average mixers, the curves of this product are highly sinuous while its design details extend beyond just good looks. While there are many mixers that come with just one attachment outlet. The Kitchen Machine features three. The arm can be moved between varied positions simply by pressing a release switch available at the top. There is a citrus-press attachment that easily transforms into a good quality juicer. In addition to these features, you will also find a mincing attachment and even a blender in this product. Add to that a storage bag coming in handy for the organization of all precious tools and a large mixing bowl, and you have got the most powerful and versatile mixer for different stages of food preparation. The automated cable rewind, multiple functionalities and a wide assortment of splashguard and tools have helped this product in acquiring a dominant position in the list of small and best kitchen appliances. Smeg is brand that has expanded beyond dishwashers and refrigerators and it is now into providing small and best kitchen appliances making its customers happier than ever. 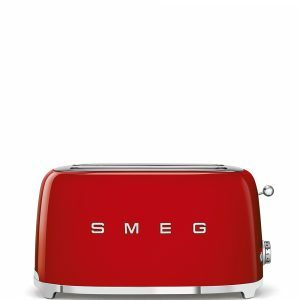 You might have never seen a more adorable and impressive toaster than the Smeg 4-Slice Toaster. It is available in eight colors and features two slots that are extra wide. It even has a total of six browning levels for getting just the perfect toasts. The Sage Boss to Go Smoothie Blender will be the best investment for you if you are in the look out of small and best kitchen appliances within an affordable range. The cups of this product have a smooth edge and are ready to drink from without going through the hassle of screwing on rims. It features a powerful 1000 watt motor that helps in making drinks with ingredients around 42% finer. The dishwasher-safe blades of this product make blending a smoother and enjoyable experience. Not only the blades but all the different parts of this product are dishwasher-safe, making cleaning and maintenance a doddle. Unlike the other blenders available in the market, this item does not have any irritating corners where food seems to get stuck. Top the features of the Sage Boss To Go smoothie blender with a robust design and a Kinetix technology blade that delivers grit-free and silky-smooth shakes and juices, and you are actually having a look at the best smoothie blender in the market at present. The item offers ultra-smooth blending and serves in the form of an innovator, solving design issues and boasting of great power. While majority of the blenders are fully satisfied by mimicking the market leaders, this blender from Sage speaks of exclusivity and elegance. The product also comes with a detailed recipe book and guide offering a lot of ideas for tempting mocktails, smoothies, nut milks and breakfast bowls. If the design of the Sage Boss TO Go blender had to be summarized in just one word, the term would be “robust”. The product offers great durability which starts at its base that is made using high quality die-cast metal. it is the base that adds to the weight of this small kitchen appliance while also adding to its sturdiness at the same time. while there are other blenders that depend on plastic and rubber connections between blades and base, the Sage Boss TO Go blades are sealed into one single unit that easily locks into the base. The blades are finely contoured for creating rapid circulation and there is even a scooped bowl available in stainless steel. Unlike blenders and juicers, the NutriBullet nutrient extractors perfectly break down the cell walls of fibrous plant foods to release important minerals and vitamins contained in them. not only this, the products also help in reducing advantageous fiber, seeds, skins, pulp into a silk and smooth texture, offering easily digestible and easily absorbable food to the users. More than blending, more than juicing, more than chewing and more than mixing, nutrient extraction gives you the freedom of receiving the highest levels of nutrition that your food varieties have on offer. always keep one thing in mind and that is to get the best out of your life it is important for you to get the best out of the food that you eat on a regular basis. The NutriBullet 12-Piece High-Speed Blender/Mixer System cracks through all kinds of fibrous stalks; rips apart pulp; shreds through the skins of vegetables and fruits and bursts open seeds in no time and everything in perfect precision. This is a portable blender and mixer system that can be used very easily and at the same time it is absolutely safe for the kids. You can use this machine for pulverizing fruits, superfoods, protein shakes and vegetables effortlessly into a smooth and delicious texture. The patented and powerful blade designs of this product speak of cyclonic action and they combine practically for extracting all kinds of nutrients from different food varieties. So. It can rightly be said that the NutriBullet Blender and Mixer System is one of those small and best appliances that can help you in achieving the healthiest lifestyle possible. This product from NutriBullet is undoubtedly one of the best small kitchen gadgets for making nutritious drinks that can be of good help to individuals who want to prevent and fight diseases, relieve joint pain, lose weight, have younger-looking skin and promote healthy living. The item features NutritBullet’s unique extracting technology that makes use of a 600 watt motor for pulverizing and breaking down skins, seeds and stem that contain the most of essential nutrition. At the temperature of around 160F and more, water is completely free of the pathogens and bacteria that live within it. it is always safe to drink boiled water and this goes special if you are travelling away from the highly advanced purification systems available in the developed countries like America. The Mueller Austria Electric Kettle Water Heater is one of the small and best kitchen appliances that you must get in order to travel trouble-free and disease-free. Always keep in mind that water does not lose its vibrancy if it is boiled for a very long time. However, it definitely loses its flavor. 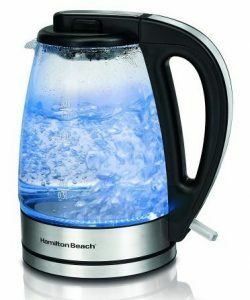 With this electric kettle water heater in your kitchen, you will know when the water is completely boiled as the product automatically shuts off. Just after being used for a long time, you can again use this item immediately without facing any major issues. The electric kettle water heater from Mueller is an energy-efficient kitchen appliance. It is more energy-efficient in comparison to the electric stoves and microwave ovens available in the market. It also helps in saving a lot of time mainly because you need short time for boiling water in this product. This further helps the users in saving a huge amount of money as well. Use this exclusive 2 Stage Knife Sharpener from KitchenIQ to sharpen all the knives that have an important role to play in the kitchen. This product comes with a unique edge grip feature that will enable you to sharpen on the edge of a table. there are two different stages of sharpening available in this small but highly efficient knife sharpener. Do not allow the size of this cute product fool you. It is a pint size device but serves in the form of a work horse when it comes to sharpening knives and other tools. you can use it easily and quickly for sharpening your knives right in the comforts of your abode. this way you will be giving a new lease of life to all your dull and damaged knives. The product offers top quality everyday knife maintenance and within a price that you might have only dreamt of. The 2 Stage Knife Sharpener from KitchenIQ is a gem at sharpening dull and damages knives at just a few pulls by way of its coarse slot. The slot comes with carbide blades at preset angles for quickly bringing dull knives back to life. It even polishes and finishes the edge of a knife with a few pulls by way of the fine slot. It is the small size of this item that makes it perfect to be stored in knife drawers. And it works amazingly well for all those individuals who do not have a large kitchen or the ones who are short on storage space in their homes. Are you craving potato pancakes or blueberry waffles? Get the Dash Mini Waffle Maker and you will get your hands on single serve culinary pleasures is just a matter of three minutes. The best thing about this kitchen appliance is that it comes with a non-stick surface which means you get to cook and brown perfectly whatever it is. Using this item is a fun activity for both children and adults. You can use it for unprocessing food with a recipe book that comes included giving you easy access to a huge database of recipes absolutely free of cost. This is one of the most versatile, small and best kitchen appliances that can not only be used for making waffles but even hash browns, paninis and biscuit pizzas. 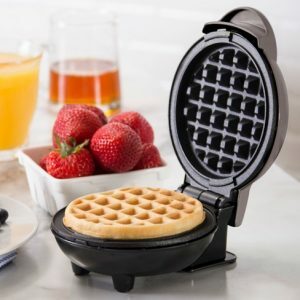 This lightweight and compact waffle maker can be used very easily. simply plug it in to find that it heats up in minutes. Weighing just 1lb, this is one of the must-have kitchen gadgets for individuals with small cooking spaces. It is perfect for first time apartment-dwellers and RV traveling enthusiasts or campers. This is also one of the most exclusive small and best kitchen appliances available in the market. It will make can opening an easy and smooth procedure for you. Considering the features and the uses of the above mentioned small and best kitchen appliances, it would always make sense to go for them if you want to have a smart and modern kitchen.